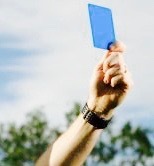 It's interesting to note that both Australia and New Zealand are trialling a system whereby a referee can show a blue card to a player to remove him from the game if that player is showing signs of concussion. The idea is to target lower levels of the game where medical support and facilities are not always available. Firstly, any move to help protect player health and welfare is to be applauded. I can see, however, this move putting unnecessary pressure on referees who will now be asked to make medical diagnoses on players, in addition to everything else they have to deal with. What happens, for instance, if they fail to recognise a concussion? To what extent will they be liable? I can envisage referees becoming understandably over-cautious with potentially farcical consequences for the game at large. And why the need to brandish a card? Which pocket will it be kept in? We need to know. Interesting indeed. On one hand, I can see the point. Much of the reffing process (particularly with signals) is for the benefit of spectators (incuding coaches). Currently, a player can go off injured (spectators don't necessarily know why) and then magically re-appear 10 minutes later. But.. on the other hand.. ONLY IN ELITE LEVELS OF THE GAME. For us plebs, HIAs don't exist and once a player is removed for suspected concussion, in theory, thats your lot. So this would be another example of the wedge between the pro & amateur game. Comically, here in Ireland we had a schools (u18) game - important enough to be televised - where some dude insisted (as a medical doctor) the ref accept back into play a player who'd been removed for suspected concussion but he had done a HIA. Ref told him to sling his hook. Turned out he was a chiropodist or some such. The referee already has this power and can insist that a player be taken off. This would seem to be merely a formalisation of the law whereby it's clear to everyone watching that the player has been injured and the referee is insisting that they leave the field of play. More for the spectators it would seem that for any safety concerns. Some quick googling has thrown up: http://www.englandrugby.com/my-rugby/players/player-health/concussion-headcase/match-officials/. This seems to tie in with Andrew's comment, that it's formalising of law. It seems fairly clear from the link and the accompanying material that there already is a duty to do so. But I also agree with TF's sentiment, in that who is liable if they don't spot concussion? After a bit more googling I would say you're definitely right, it's not explicitly mentioned anywhere in RFU documentation (the best I could find is a reference from the online concussion which lists "Coaches, Match Officials, Players and Teachers, Parents & Guardians" [http://www.englandrugby.com/my-rugby/players/player-health/concussion-headcase/]). To me, this suggests that the onus is on the referee to DO something once concussion has been flagged, but they are NOT SOLELY responsible for spotting concussion?